Location: North 61:43.591, East 006:19.013 (GPS at the summit). How to get there: Travel to Byrkjelo along E-39. Continue along E-39 towards Sandane. 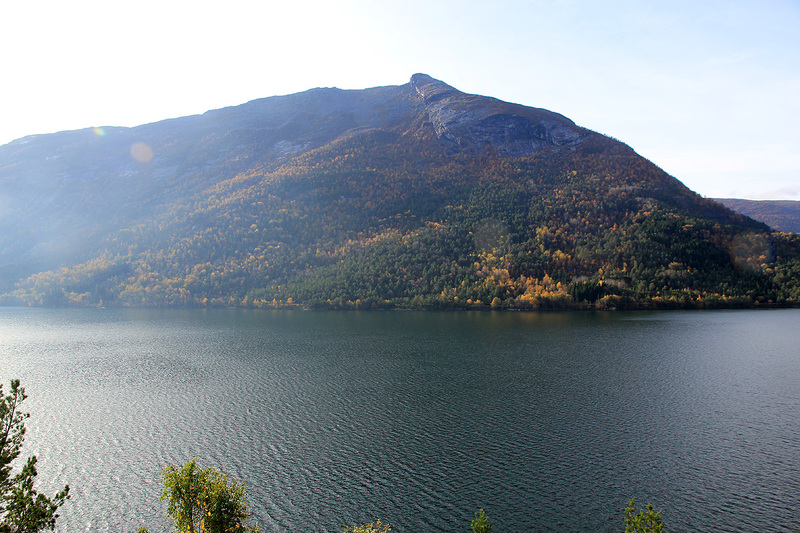 You will first see the lake Breimsvatnet, then drive along it. Just after driving through 2 tunnels (one short, one somewhat longer), look for a road going left with the sign "Kandal 14". Turn left and measure from here. Drive 300 meter and take a right fork (downhill). Drive downhill and cross the bridge. Find the first road going left after this bridge. This location is N61:44.879, E006:16.449, elevation about 70 meter. The distance from E-39 is about 600 meter. Turn left and drive approximately 600 more meter. There is a pretty large open area here. This is a possible place to park if you do not want to drive further uphill. The forest road continues all the way up to Ryssdalsstøylen at about 500 meter. There is a road fork part way up, where one should go left (uphill). This road is (fall 2010) fairly good and can be driven by normal cars if driven carefully. However, the road is a bit rough (loose rocks) in a few places and it is very steep in the upper part. A somewhat high clearance as well as 4WD would be preferable. The steepest part is very smooth, but enough traction is important, do not attempt this unless the road is dry. There is parking at the end of the road, location N61:43.979, E006:17.474, elevation about 509 meter. 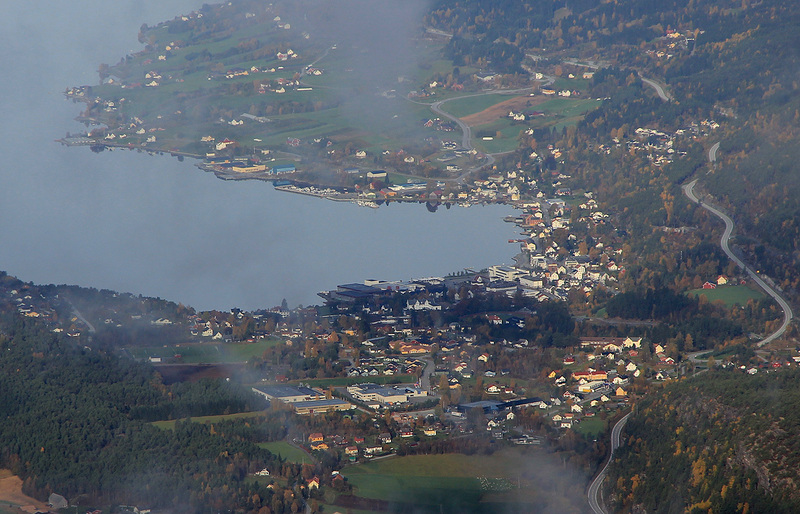 From Ryssdalsstøylen, head directly (left) towards the steep slope above. The trail is easy to see if you walk just behind a huge boulder that is located fairly close to one of the huts near the start of the uphill slope. Hike uphill, the trail has some red "T" painted on rocks as well as a few red and white wooden poles (short ones). 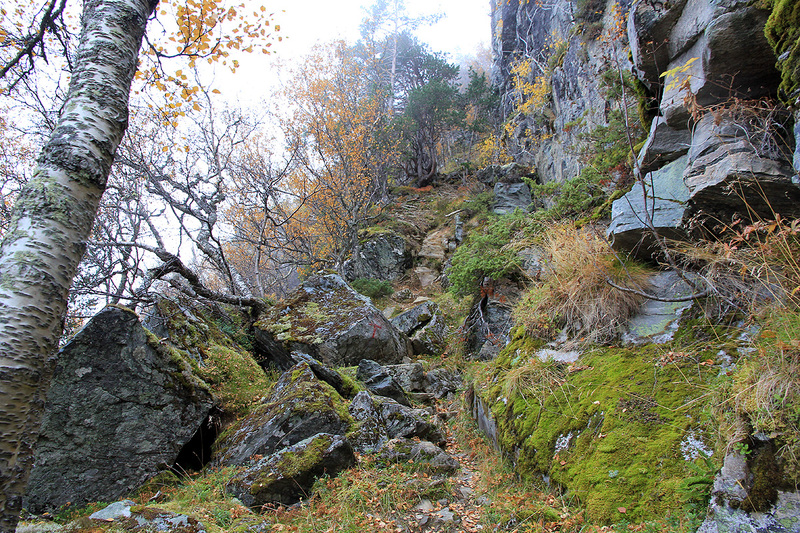 Higher up, the trail is less distinct as it runs straight up a small area with boulders. 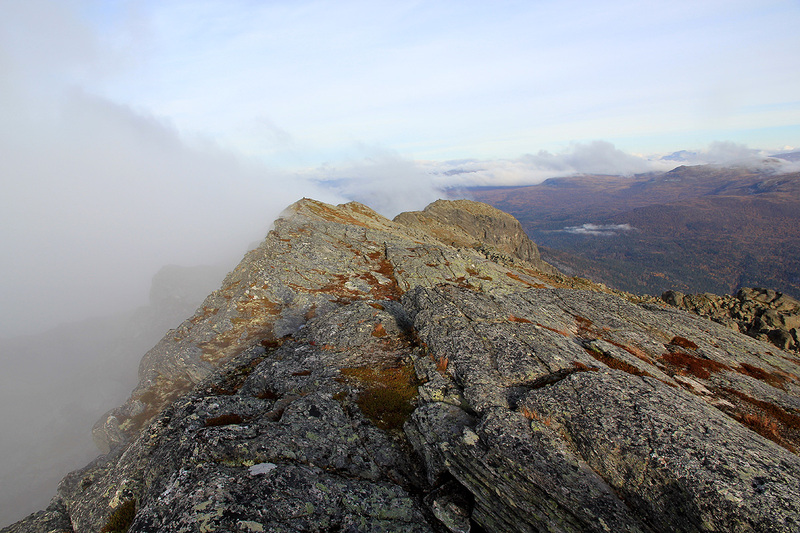 Ascend to the top of these rocks, then observe a red arrow pointing left a bit higher. Traverse left and complete the final section before gaining the (main) north-west ridge. This section is the crux of the trail, it contains two short sections where you must use your hands. The trail is rated (YDS) class 2+ because of this section. There is no real difficulty and no exposure, but the trail is steep. As soon as you emerge on the main ridge, the trail turns right and continues uphill. There are several "false" summits, but the trail is quite easy to follow. Eventually, the trail reaches the col just south of point 1160. From here, the ridge is fairly flat. The highest point is at the far end, a bit more than 500 meter away. 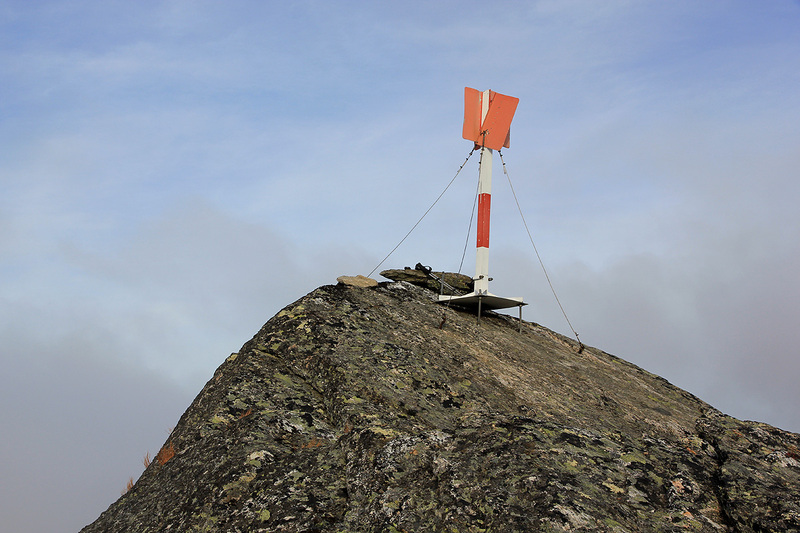 There is a trig point at the summit and a small cairn nearby. 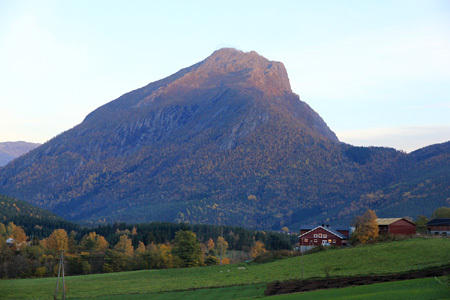 I drove across the old Strynefjell road after my visit to Søre Svartkampen on Saturday. It was a very nice drive with a good view of Skåla in the early evening. I was pleased to find an open hotel in Sandane, even better, an old, historic hotel with friendly people and a good restaurant. After a nice dinner, I was ready for a good night sleep. No need to hurry as I had breakfast shortly before 0800, checked out and set out to find the trailhead for Ryssdalshornet. 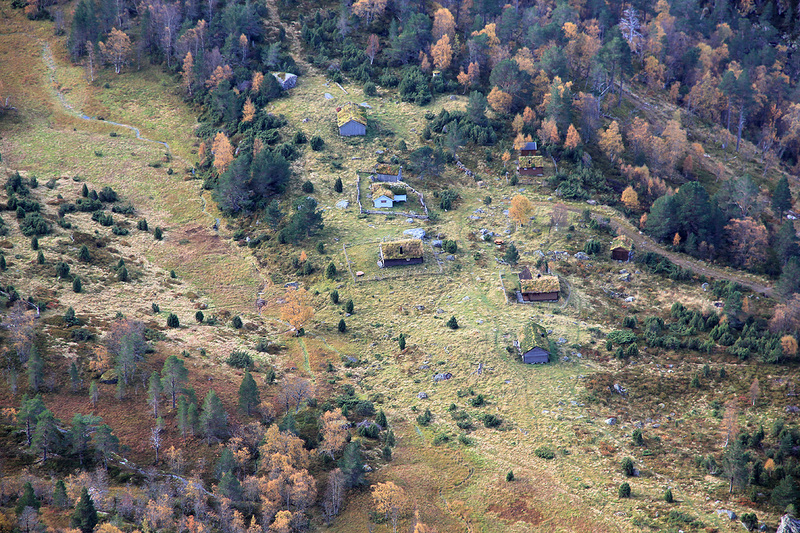 I had no idea how far one could drive towards the (mountain) farm huts at Ryssdalsstøylen. However, the road looked pretty good and I started driving my Saab (Cab) up the somewhat steep and partly rough forest road. Things were going well until I failed to notice that the mid section of the road was a bit high, this could easily have been tackled by driving with the wheels on the shoulder of the road. Bang, and a rock hit the from exhaust muffler. Too bad, I just replaced it after this Easter, now I had the "vroom - vrooom" sound back in full force. I took the hint and parked slightly higher at about 300 meter, there was a nice spot off the road on the right hand side. 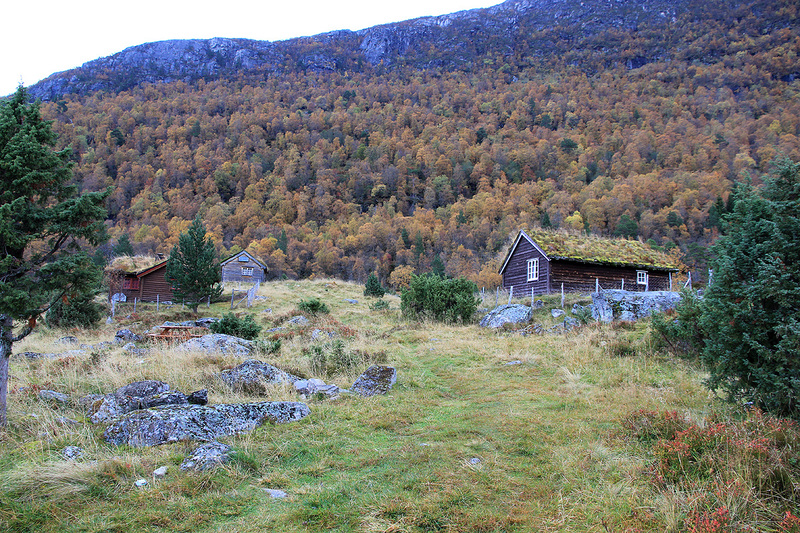 I started hiking at 0850 and quickly got up to the nice Ryssdalsstøylen, quite a few small huts up here. The trail that started out from here was easy to follow with a slightly steeper section (not difficult) in order to gain the main ridge. 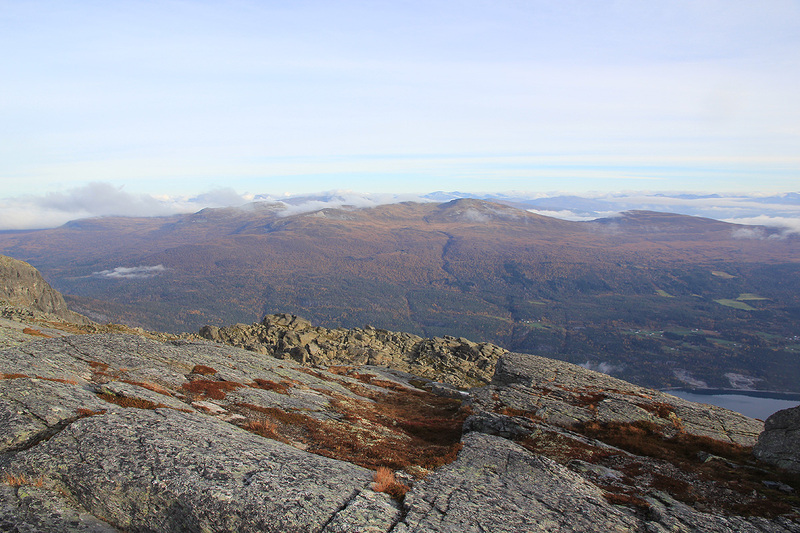 I arrived at the top ridge and followed it to the highest point at the far end. The time was 1020, so 1:30 from my car. Unfortunately, the views were limited as there were too many clouds drifting about. I still enjoyed the changing views and sat around until 1040 before heading back down. 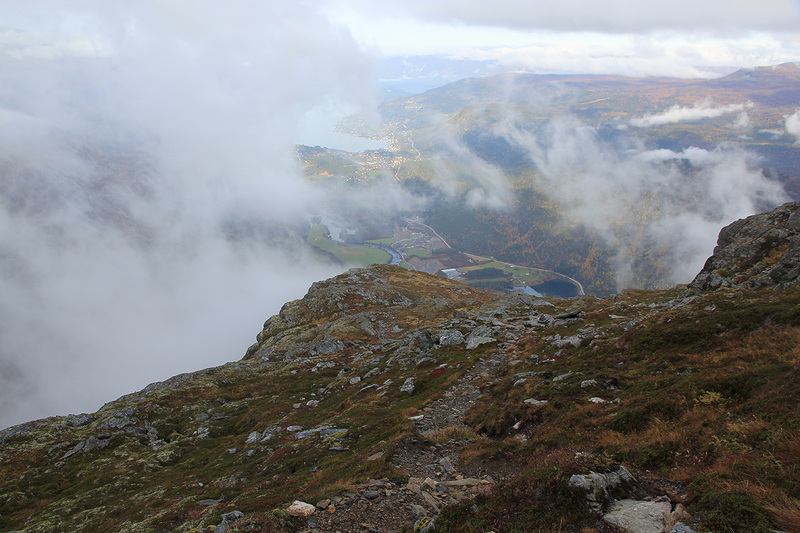 The trail was nice and the view to Sandane kept changing because of drifting clouds. 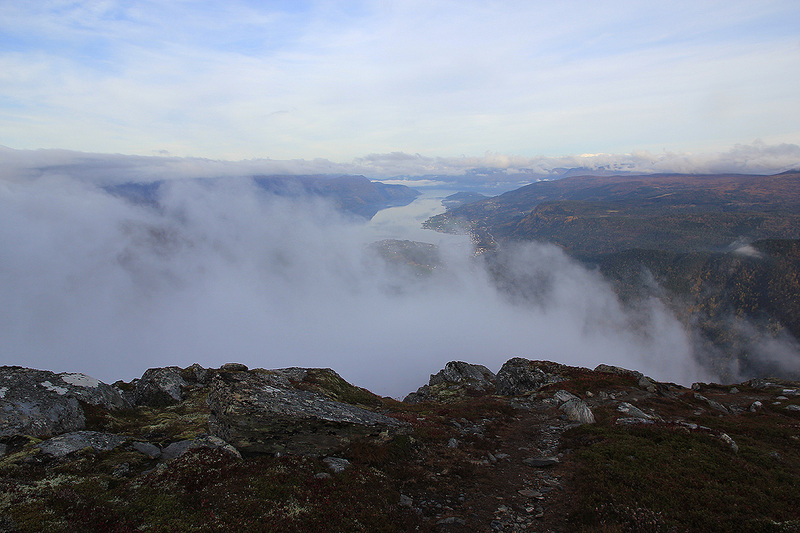 Just before leaving the ridge, one can look directly down to Ryssdalsstøylen. Going down, I met a single hiker on his way up, just below the crux part of the trail. We talked a bit, he was a local that had hiked here numerous times. Saying goodbye, I continued down and reached the car at 1155. 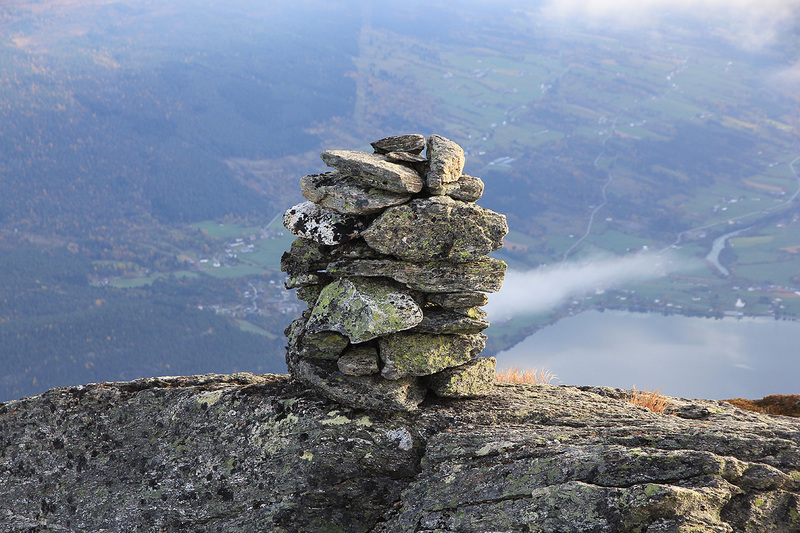 This was my last peak in a 3 day trip that also included looking after my mountain hut in Lillehammer and preparing for winter. Ryssdalshornet as seen from Sandane. Ryssdalshornet as seen across lake Breisvatnet. The top ridge, looking north. Sandane, from the north ridge.